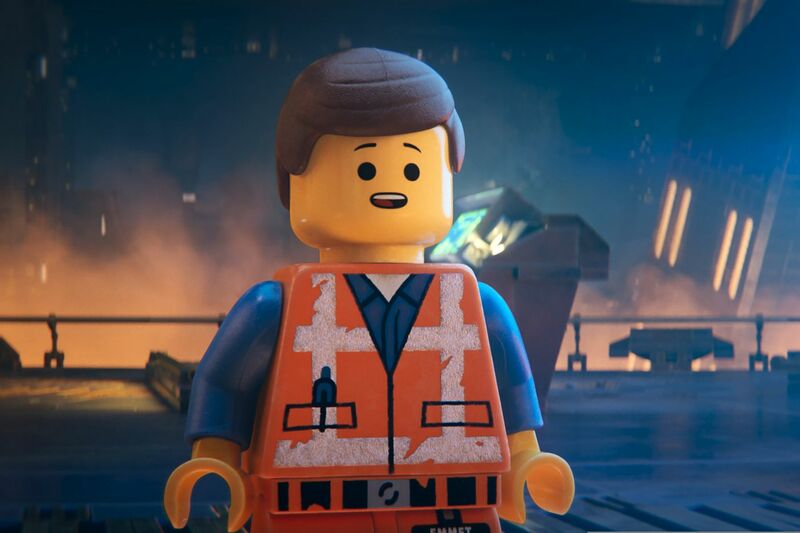 At the close of 2014′s animated hit The LEGO Movie, the real-world reconciliation of father and son concluded with a chilling warning of things to come: Now, said dad, it’s time to loop in your sister. As promised, this is the starting point for The LEGO Movie 2: The Second Part, wherein the animated adventures of plastic block characters Emmet (voice of Chris Pratt) and Lucy (Elizabeth Banks) represent the realm-of-imagination projections of sibling rivalry. We start in the boy-brain dystopia of a lad who’s seen and loved Mad Max: Fury Road, and constructed a toy world that serves as an homage to post-apocalypse movies (shout out to Planet of the Apes) and a nod to the movie’s main idea — his play paradise is lost, now that he has to share it with sis. Her intrusions take the form of an alien invasion, the cutest ever. Pink and yellow emissaries from the Systar System kidnap several of Emmet and Lucy’s friends (including Will Arnett’s Batman) and drag them off to a girlish hellscape of sparkle and glitter and K-pop, where spa treatments and brainwashing prepare the abductees to participate in some ghastly, coercive ceremony, otherwise known as a wedding, presided over by shape-shifting Queen Watevra Wa’Nabi (Tiffany Haddish). The movie’s broad-strokes sketch of gender norms — literally cartoonish — is balanced by the less rigid borders of the characters. As writers Phil Lord and Chris Miller remind us, it’s often Lucy who acts decisively and heroically, and the same is true here — she and Emmet work together to infiltrate Systar and retrieve and liberate their pals. It’s Lucy who implies that Emmet is not “tough” enough to lead the mission, and so he enthusiastically seeks the coaching of macho adventurer Rex Dangervest (also Pratt, doing an impersonation of Kurt Russell doing an impersonation of John Wayne), who rides in a spaceship steered by raptors and fueled by classic rock power chords. Emmet is eager to learn his mentor’s “alpha wolf bro dog” skills, which include smashing things, and I guess you could say Rex is the expression of plastic masculinity. This examination of masculine archetypes worked with more sophistication in Toy Story, with soft fabric, sensitive Woody measured against the hard-shell bombast of Buzz Lightyear, and in general, LEGO 2 — though bouncy and propulsive — feels cribbed from other, better films, including the ingenious LEGO Movie original. It’s an edifying message, but receiving it isn’t as much fun as it was five years ago, when the movie’s characters and secrets were fresh. What’s just as good is the animation — the Systar System with its translucent pastels, and the post-apocalypse wasteland that Emmet so memorably describes as “heckish." Directed by Mike Mitchell. Featuring the voices of Chris Pratt, Elizabeth Banks, Will Arnett, and Tiffany Haddish. Distributed by Warner Bros.